The hotel is located in one of the quietest beaches of Palma, just 150 meters from the beach and 3 km from the airport. The rooms offer ocean views from the terrace, the hotel is well preserved and quiet family character. It is characterized by personalized customer, always taking care of the small details. Hotel staff cares at all times to meet the needs of our customers in order that they may feel, as far as possible, as comfortable as in their own homes. 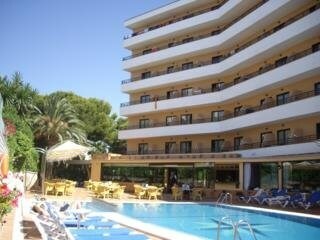 It is located in a quiet area of Playa de Palma and 200 meters from the sea. The capital, Palma de Mallorca, is just 14 km away. The Playa de Palma, is a white sand beach of more than 5 km. In length. Its waters are ideal for swimming but also for the practice of any water sport.